On February 16 the Wine Society of 18% in Malmö, Sweden, had a very interesting tasting of Carcavelos, the forgotten fortified wine from Portugal. Just west of Lisbon along the coast lies the small municipality of Carcavelos. This has been a place for wine growing since the roman times, and in the mid 18th century the wines from the region had a worldwide reputation. Marquis de Pombal had a Palace and wine estate here, and built a reputation for Carcavelos. Before the demarcation of Douro in 1756 he even sold grapes from Carcavelos to Port producers. During the 19th century the fortified wines were very popular, especially in the British market and in 1908 the region was officially demarcated and it still is classified as D.O.C (Denominação de Origem Controlada). The 20th century turned out to be devastating for Carcavelos wines and its vineyards. As Lisbon grew and new hotels near the coast were built, more and more vineyards were sold in the real estate business. In the early 1980s there were only ten hectares of vines left. The Ministry of Agriculture owned what was remaining of Pombal’s vineyards in the 1980s and they realized they had to do something to save what was left of Carcavelos traditions. Between 2002 and 2009 they doubled remains of the old Pombal vineyard to 12.5 hectares. Since 2004 the vineyard is owned by the municipality and a new brand was created, called Villa Oeiras. Carcavelos wine is made from up to nine different grapes, both white and red. The most important of the white grapes are Galego Dourado, Ratinho and Arinto. The most important red grapes are Castelão and Preto. The wine is fermented completely dry and then alcohol (wine brandy) is added to bring the wine up to about 18-20% alcohol. A small part of the wine must containing residual sugar, called vinho abafado, is set aside before fortifying the wine and is then added to get a sweet wine. The wine is then aged in barrels and receives a light Tawny like color. 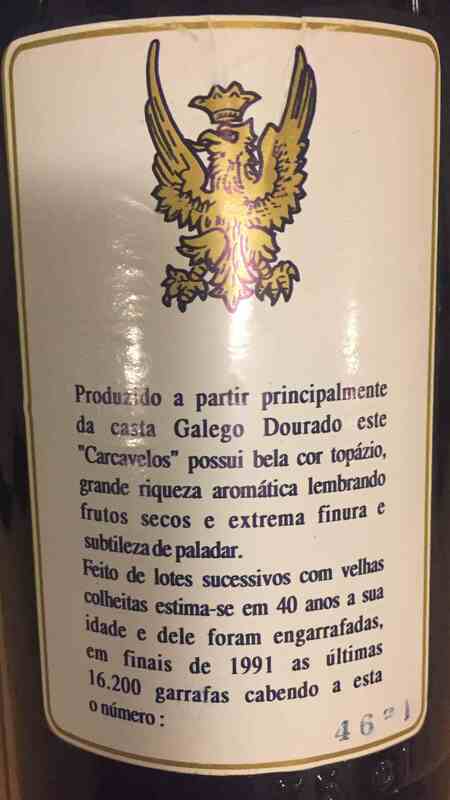 The style is very unique but it is somewhat similar to White Ports or some Madeiras. In the tasting in Malmö we had 9 Carcavelos and 3 other more well-known wines for reference. Note that the tasting was conducted completely blind, meaning we did not know it was Carcavelos we tasted. The points are always affected to be more moderate in blind tastings, especially when the style of the wine is completely unique and un-common to what we are used to. This is what we tasted (in this order), with the average points from the group. 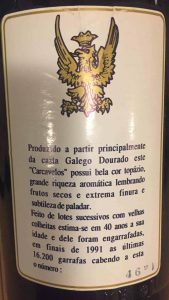 This entry was posted in Wine tasting and tagged Carcavelos, Quinta da Bela Vista, Quinta de Ribeira de Capride, Quinta do Barao, Quinta dos Pesos, Villa Oeiras on February 26, 2017 by Stefan.